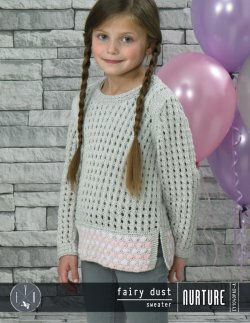 Check out some of the garments & designs found in Nurture - Fairy Dust Sweater. Measurements To Fit Chest: 22 (24, 26, 28, 30)in/56 (61, 66, 71, 76)cm. Actual Size: 26 3⁄4 (28 3⁄4, 31, 33, 35 1⁄2)in/68 (73, 79, 84, 90)cm.